David Rock’s book, Your Brain at Work, is a great read. Until you have a chance to read it yourself, here are some key points from it. Prioritize. Your prefrontal cortex, just behind your forehead, is where you do most of your really valuable thinking. As David Rock says, “The prefrontal cortex is the Goldilocks of the brain. It has to have everything just right or it doesn’t function well.” To use this precious resource to its highest potential, prioritize, prioritize, prioritize. Focus on one thing at a time. Switching between tasks drains energy from your pre-frontal cortex very rapidly, causing you to take longer to complete the tasks and to make more mistakes. Remove distractions. Being “always on” – plugged into your phone, your email, your social media – leads to exhaustion. Shut them down before you try to concentrate. Focus your attention on the most important, sometimes the most difficult, task of the day. Approach it in an alert and interested frame of mind. Imagine the satisfaction of having it done balanced with a mild fear of what could go wrong if it is not done. We tend to “walk toward reward, but run away from punishment”, so use that to keep yourself energized and focused. Relax at an impasse. We all get stuck at some point during productive work. Take the pressure off by getting an extension on your deadline. Go for a walk, take a new perspective, look for patterns and links, use humour, and, most importantly, sleep on it. You will often find that a night’s sleep can show you the solution the next morning. Label and work with your emotion. Recognize and label your anxiety and frustration; don’t try to suppress it as that would only make it worse. Our limbic system is easily aroused and wants to minimize danger and maximize reward. Sometimes a sudden rush of emotion might cause you to back away from the work, or put it on hold. Observe what is happening, and direct yourself to a solution, knowing that you have handled challenges like this in the past and you will be able to do so again. Choose your response to whatever difficulties arise. Certainty and autonomy are primary rewards for your brain; the opposites are threats. Reappraise the situation, adjust your expectations, accept a certain amount of uncertainty, and remind yourself that you have the autonomy and skills to handle the obstacle. Be open and transparent in your dealings with others. 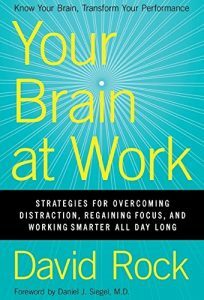 David Rock noticed a surprising pattern as he put his Your Brain at Work book together. He calls it the SCARF model, which stands for Status, Certainty, Autonomy, Relatedness, and Fairness. Watch David Rock explain how using the SCARF model can help you and others be more engaged and productive at work.